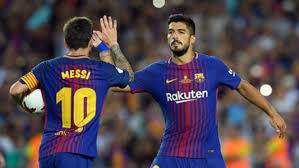 FC Barcelona are back at the Ciutat Esportiva and they have turned their attention towards the La Liga match against Sevilla following their 0-0 draw Olympiacos in the fourth round of the Champions League group stage in Greece. The draw brings the blaugranas within touching distance of a round of 16 place. The players were put through their paces on the Tito Vilanova pitch at the Ciutat Esportiva Joan Gamper. Ernesto Valverde’s men started preparing for the eleventh league match of the season at the Camp Nou at 8.45pm CET on Saturday. The training session saw seven Barça B players take part: Moisés, Martínez, Santi Bueno, O. Busquets, D. Concha, Alfaro and Vitinho. Moreover, we saw Andrés Iniesta training with the group. The blaugranas will train on Friday at 6.00pm CET in the final session before the Sevilla match in which they will try and secure another victory to end on a high before the next international break. Sevilla is next and we want nothing less than 3 points.....With the form that Messi on right I don't see Barca dropping points any time soon.....Barca to win 4-0 Messi with a brace and yours?